Brief Synopsis – A director suffering from “director’s bock” tries to use his own memories and fantasies to think of an idea for his new film. My Take on it – I’ve never been much of a fan of foreign films and ones that rely too heavily on abstract ideas have always been among my least favorites. I know that Frederico Fellini is considered to be one the best director ever, but this film comes across as being too surreal for my own taste. The overall idea is an interesting one, but its presented in too strange a way to enjoy it. This film does manage to show the power (and weaknesses) of a director who wants to find a way to fulfill his dream idea even if he has trouble pinpointing that idea. The plot is very confusing and goes to some very far away places that take away from the enjoyment of such a story. I can’t say that I’m surprised that this film was able to win Best Foreign Film at the Oscars along with a nomination for Fellini for Best Director since the Academy members have always been quick to nominate artistic films even if they have a very incomprehensible story. I guess this film is further proof that I am just a film lover yet far from being a student of foreign or artistic films and what they represent. Bottom Line – Interesting idea that is a bit too surreal for my own personal taste. 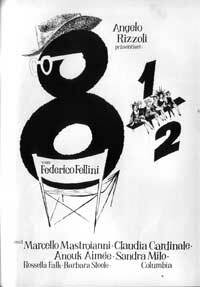 I know that Fellini is considered a master of film making and some of the ideas used here are enjoyable to watch, but the story itself comes across as being way too confusing and strange. I’m not surprised that he got a Best Director nomination at the Oscars and that this film managed to win Best Foreign Film, but that still doesn’t change the fact that much of this story is completely incomprehensible.